We had hoped to reach 400 birds on our just concluded Atlantic Canada trip but came up one short. Since 400 sounds much better than 399, we were determined to go for #400 at the first opportunity. With Black Swift as our target, Phil and I headed to Banff early on Thursday. 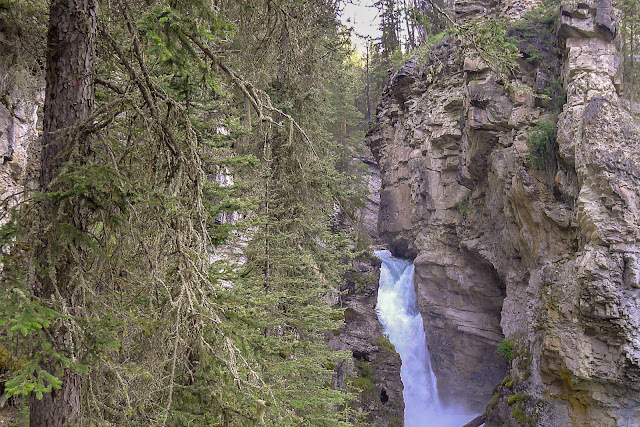 I had seen a Black Swift on a nest in Johnston Canyon three weeks ago but, when the team went there a few days later, there were no swifts to be found. 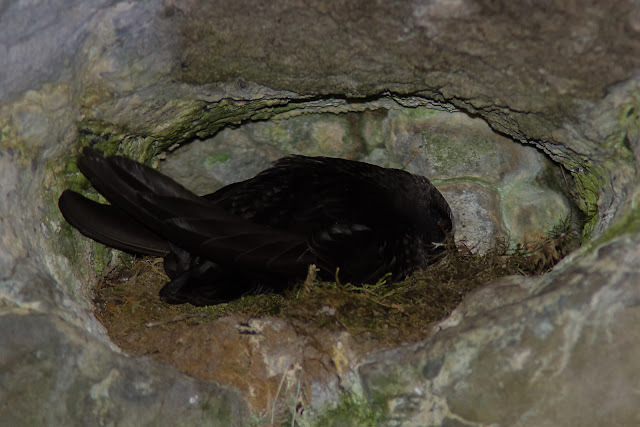 This time, the nest where I had first seen the bird was empty but we found an occupied nest just a few metres away. 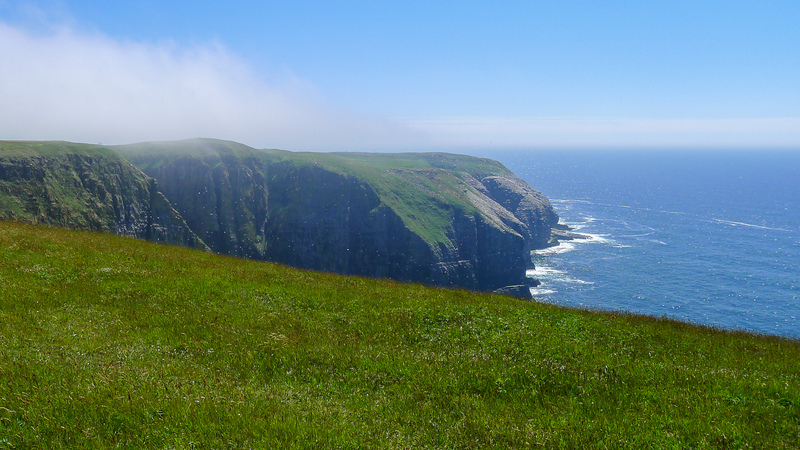 Our Atlantic Canada trip was very similar to most of our other trips this year – very enjoyable, reasonably successful in finding birds and not so successful with mammals. 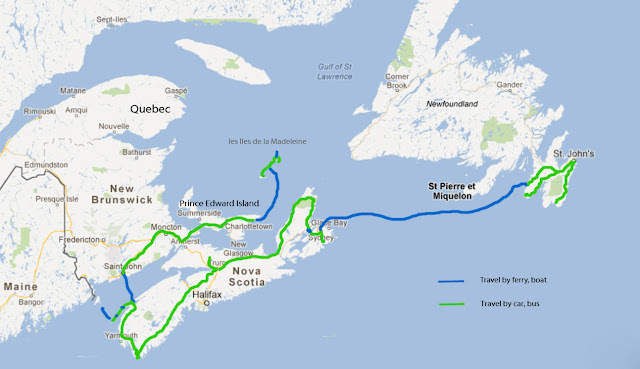 We visited 5 provinces, drove over 3000 km and rode on 4 large ferries and 5 smaller ones. In doing a big Canada year, one cannot be everywhere at “prime time” and thus must make some compromises. We chose the past two weeks to go east for a number of reasons: 1) to see some seabirds at their nesting sites, 2) to have a chance at Bicknell’s Thrush and 3) to give ourselves a break after trips in quick succession to Point Pelee, BC and to the Yukon and NWT. For this trip, prime time would have been a couple of weeks earlier but still we managed to get most of our target birds. We had hoped to get some more whales but knew that we were a bit early. It is likely that we will be back in mid-late September and should have a good chance at 2 or 3 of the marine mammals that we missed. As in past trips, local birders contributed greatly to our success. 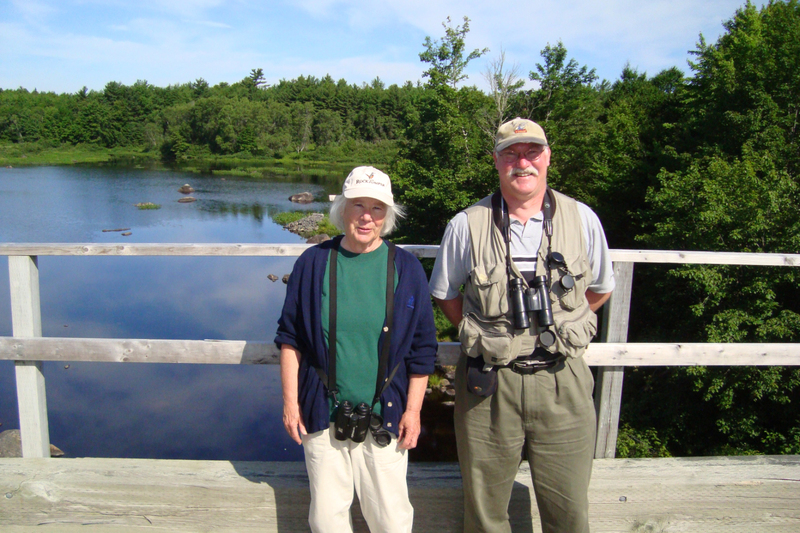 James Hirtle in Nova Scotia and Anne Hughes in Newfoundland went far out of their way to show us some good birds; Jame’s friends Dorothy and Johnny also were very friendly and helpful. Part of our mission this year is to find some interesting places whether it be for scenery, local culture or wildlife. Les isles de la Madeleine met all three criteria and were a real treat – fascinating geography, touristy but without the tourists, funky restaurants and some good birds. We even tried to speak French but more often than not, Spanish came out instead. 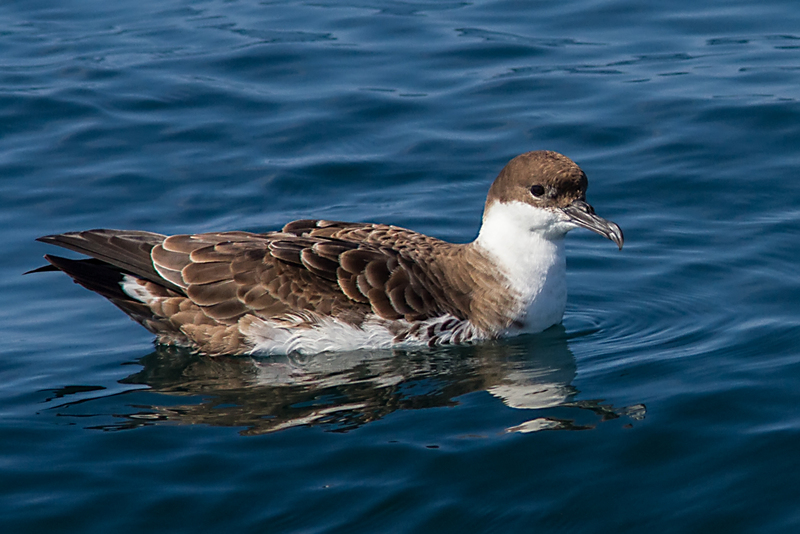 The birding highlight for the islands was our visit by zodiac to Ile Brion. 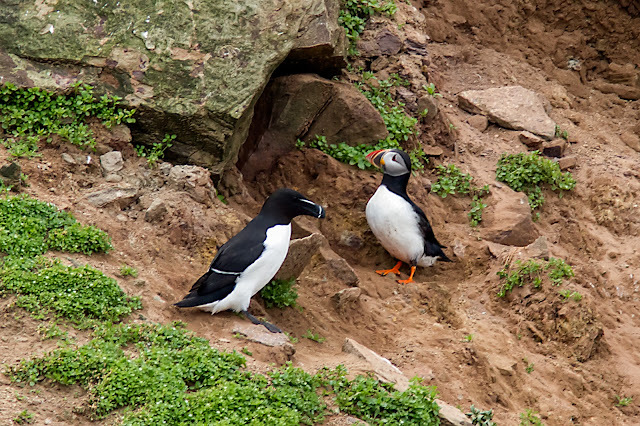 This was our first look at the nesting seabirds that we had come to see … Atlantic Puffins, Razorbills, Common Murres and Black-legged Kittiwakes. The return trip was also memorable for the rough ride into the wind. Razorbill and Atlantic Puffin ... wouldn't they create an interesting hybrid?! 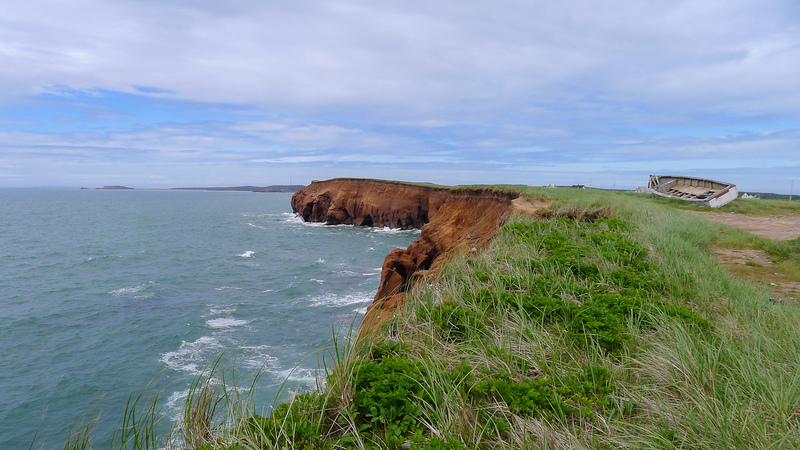 It was interesting to see the contrast between PEI and les Iles de la Madeleine – PEI’s economy is based on tourism and agriculture whereas the other is based on fishing. For whatever reason (perhaps tourist accessibility? ), PEI appeared to be much wealthier. Nova Scotia was where most of our target birds resided so that is where we spent most of our time. The American Oystercatcher and Roseate Terns in the south and the Bicknell’s Thrush in the north were new Canadian birds for most of us. We had fantastic weather for both of our boat trips - whale watching in the Bay of Fundy and a Roseate Tern expedition. 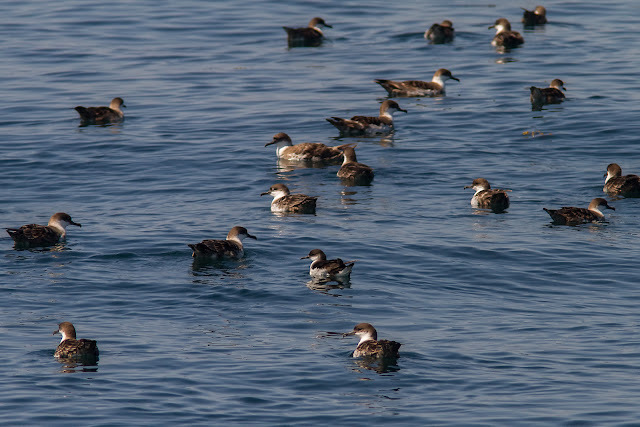 A highlight of the whale watching trip was up close viewing of rafts of shearwaters. We made use of the 800 km in between southern NS and Cape Breton by tracking down some widespread birds that we had missed in Ontario and had chosen not to go after in central Alberta. With the help of James Hirtle and others, we were pleased to see Yellow-bellied Flycatcher, Black-backed Woodpecker and Mourning Warbler. In Newfoundland, the fog thwarted many attempts to view seabirds. However, Anne Hughes’ sunny disposition and vast knowledge of the birds and where to find them eventually led us to success. 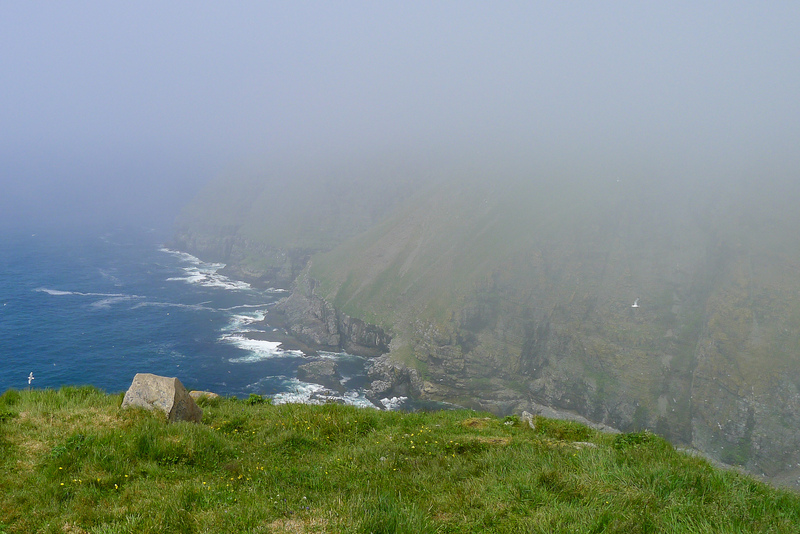 Cape St. Mary’s was somewhat mystical in the fog with thousands of seabirds very close (and noisy) but very difficult to see. When the sun came out, it was spectacular but we were only able to enjoy the views for a few minutes before hustling back to St. John’s to catch a plane. Overall, we had 18 new team birds on the trip and 4 new team mammals. 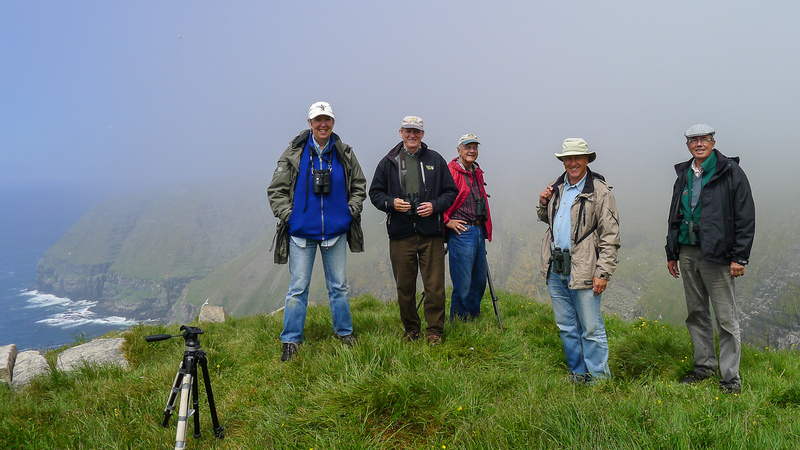 Including the Black Swift seen on our return to Alberta, we are now at 400 birds and 60 mammals for a total of 460. This exceeds our original target of 450 (which we figured would be too easy) and leaves us with 40 species to reach 500 … which certainly won’t be easy! We will enjoy a “summer holiday” at home for the next few weeks before heading off to Manitoba (province #10) and Nunavut (territory #3) in August. Until then, our posts may be infrequent unless you are interested in our golf scores!